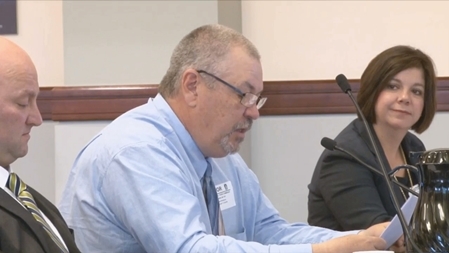 Kentucky Local 1969 member Dean McCoy recently testified at an International Trade Commission hearing with an emotional five-minute plea that conveyed frustration felt by many middle-class workers who are forced to compete against cheap Chinese goods. Silence gripped the packed hearing room about a mile from the White House, as the 26-year IAM member gave a vivid account of damage caused by the illegal domestic dumping of Chinese imports, a violation that routinely goes unenforced by the U.S. government. “Given my various positions with the union, hands-on work in the plant and in the industry, and commitment to the community, I know that our jobs and the welfare of our community are at risk,” said McCoy. For years McCoy has worked at Arkema Inc. in Calvert City, a sleepy rural town located along the Tennessee River. He’s employed as a loader, a high-skilled position which requires him to place plant-produced refrigerants and byproducts on rail cars and truck trailers. Once his job is complete, the containers are shipped across the country for sale. But Arkema’s viability has been threatened as China illegally saturates the domestic market with its low-grade version of refrigerant, a problematic practice that could cut jobs at Arkema and threaten McCoy’s livelihood. Watch: McCoy’s testimony to the International Trade Commission.